Satoshi’s vision is very much alive. Nobody wants to miss out on the journey even though it is going to be one hell of a ride. Hindsight is an incredible thing. We now know that a Bitcoin investor could have easily sold back in January 2018 when the price was still above $15,000. We are also cognizant that a Bitcoin investor should have not bought at the high of the last mania in hopes of Bitcoin soaring to $25,000, $30,000 or even $50,000 per Bitcoin. One thing we do know for sure: once you bought them, you have to be careful how you store digital currencies. Easier said than done – and nobody knows this better than Michael Terpin. The American entrepreneur and investor has been part of the Bitcoin space for a long time. Since 2013, he has been a part of a group of Angel Investors that invest in young Bitcoin companies. Their name: BitAngels. Back in March 2014, this also led to one of the first digital currency funds. Terpin is now a consultant for Alphabit Fund, one of the biggest hedge funds in the crypto sector. This is, however, all secondary. Today, Terpin is subject to headline news due to his immense misfortune – and his own legal creativity. In January of this year, he was the victim of a cryptocurrency theft that was the equivalent of $23 million. Terpin became victim to a new type of scam where an attacker gains access to the SIM card of the cellphone of their victims. Many websites use the mobile number of their users as a further security measure for more online safety by sending a SMS if there is unusual activity on an account or if certain steps need verification. This is called two-factor authentication (2FA), which can also be achieved with Google Authenticator and Authy. As with almost all security features, 2FA can be misused if hackers are able to gain control over the mobile device. This method of digital identity theft is also used to illegally gain access to popular social media accounts. Those are then sold via the Darkweb and traded in Bitcoin. But in Terpin’s case, it wasn’t his Instagram handle that was compromised. Instead, Bitcoin and other cryptocurrencies were directly stolen from his account. How do we know this? From the victim himself. He argues that the fault lies with his mobile provider AT&T, and he wants to go to court. His lawyers have prepared a 69-page paper, which supposedly illustrates the culpability of the network operator. Terpin is suing AT&T for compensation of the stolen $23.8 million – based on the price at the time the digital currencies were stolen. The day the hack occurred was January 7th, 2018, when a single Bitcoin was worth just over $17,000. This was also the day that the Bitcoin price spiked for the last time. During the following four weeks, the price plummeted by more than 60 %. It finally stopped at roughly $6,000. At the time of writing this report, the price is only merely above this mark. One could almost assume Bitcoin has reached some kind of support at this level. This is at least what investors hope, although a further sell-off could be on the cards. When a price floor is broken on the downside, it spells trouble for investors because this floor becomes a resistance level on the way back up. As we suggested in the technical analysis article featured in our March edition, there have been two price rallies since our last report but no new higher highs. The bear market is still in full swing. Anyhow, Michael Terpin has bigger fish to fry. He is not only suing for the stolen money but also for damages of $200 million. Should Terpin’s lawsuit be successful, he will not only have found a way to balance out his portfolio against the ups and downs of this volatile market but also how to 10x his money during the bear market. It goes without saying that AT&T refutes any kind of responsibility. What does this story teach us? Even investors that have been in the sector for years and have accumulated millions are none the wiser when it comes to securing their crypto stash. The details of the heist are not 100 % clear; however, the press coverage leads us to believe that Terpin kept most of his portfolio at an exchange and that one or more of Terpin’s trading accounts were simply wiped out by a hacker. A further possibility would be that he had saved his private keys insecurely, for example, in his email account or on one of the cloud service providers. Both insecure options that are not advisable. However, he is not the only one having trouble storing his stash. The question of how to securely store Bitcoin has been around since the emergence of cryptocurrencies. At first glance, it would seem ironic that cryptocurrency users often store their cryptocurrencies with intermediaries such as exchanges and banks because the public blockchain technology was designed to work without banks, registrations, or licenses. It is its own monetary system which insures reliable trade via the Internet. This was reason enough for technically savvy early adopters to get into Bitcoin. And still we can observe that in extreme circumstances Bitcoin continuously plays its role as a safe haven currency. A look at Venezuela’s current situation of hyperinflation is enough to underline this theory. In stark contrast, we can see that Bitcoin remains mainly a speculative asset in the West where price inflation is relatively stable and low, at least for now. The question of access and storage of digital assets remains largely unanswered. The mainstream investor does not want to bother with private keys or hardware wallets. Cumbersome access and storage also deter institutional players from the sector. Mature solutions for Bitcoin custodianship are only slowly trickling onto the market. The investment bank Nomura founded a consortium with the companies Ledger and Global Advisors to come up with a veritable solution. The name: Komainu. Also, three big banks are working on their own solutions: Bank of New York, JP Morgan, and Northern Trust. Coinbase charges a onetime fee of $100,000 and then a further 0.1 % fee once a month – for a minimum storage of $10 million. Coinbase calculates that assets of roughly $20 billion could flow into custodian services. The problem is definitely not new. Traditional assets, such as cash, gold bullion, or diamonds also need custodians, which have made a reputation for themselves over the centuries. Cryptocurrencies need to be protected against hackers and in many cases their legal status is not yet defined. Established traditional players such as JP Morgan and Northern Trust are understandably hesitant. They would like to enter the market, but are naturally “extremely cautious”, as a source has told Bloomberg. We will of course follow the further development of custodian services for Bitcoin and other cryptos. Bear markets are the ideal time to improve on the actual infrastructure of the market. The tentative progress of the custodian sector is a very real reminder of how young this market still is as a whole – and a good indication as to how long it could still take to fully mature. A further sign: The boom of 2017 drew in the attention of millionaires to Bitcoin. As the yearly Capgemini World Wealth Report shows, more than half of the world’s high net worth individuals (HNWIs) are at least superficially interested in Bitcoin. However only a third feel adequately supported and informed by their wealth managers. What does that tell us? That two thirds of the best wealth managers in the world don’t have a clue about Bitcoin. As their rich clients are starting to complain about this, we guess things will change quickly. 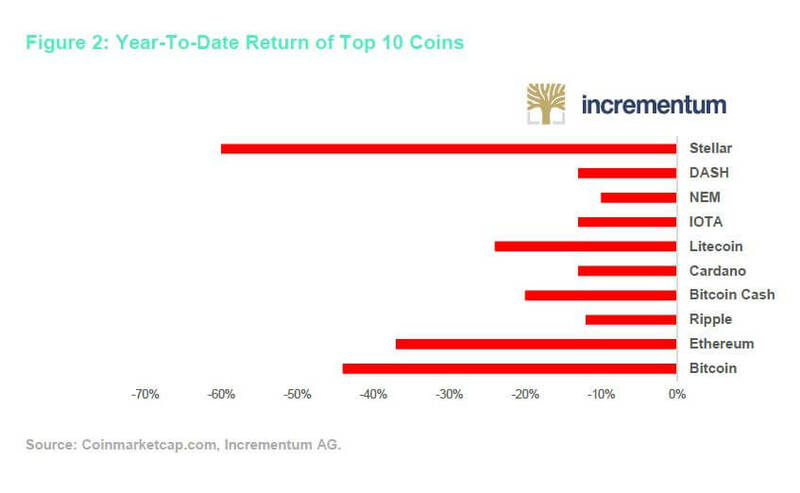 That is one main reason Incrementum publishes the Crypto Research Report. We strive to inform investors and also offer cryptocurrency investment solutions such as an AIF-regulated cryptocurrency fund. Back to the question of custodianship: Fidelity, one of the largest US-American finance providers, would like to establish itself in this field. CEO Abigail Johnson can be considered one of the most famous pro-Bitcoin voices the mainstream has to offer. 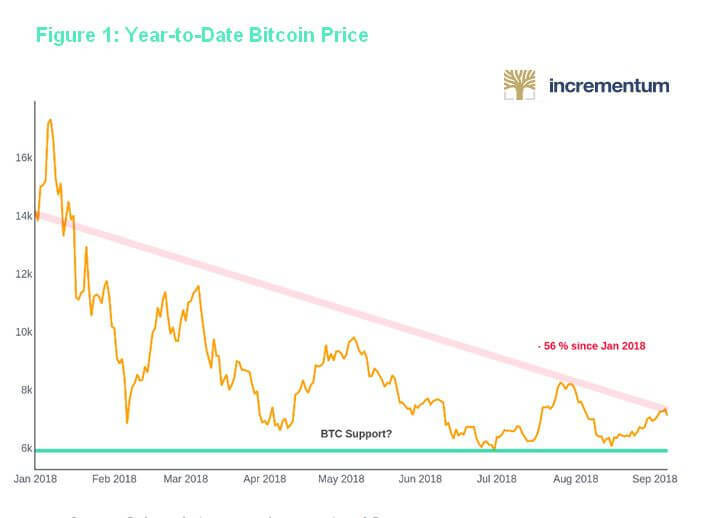 Johnson publicly supported Bitcoin as far back as May 2017. She also does not want to settle on the mere question of storage for Bitcoin. Her goal is easier access for all mainstream investors. A possible solution: Fidelity could be working on its own crypto exchange. The race for the next big crypto exchange is totally on. The Swiss stock exchange is working on a crypto trading platform. It supposedly will be one of a kind and is due to start running in early 2019. “This is the beginning of a new era for capital markets infrastructures. For us it is abundantly clear that much of what is going on in the digital space is here to stay and will define the future of our industry,” said SIX CEO Jos Dijsselhof. The stock exchange in Toronto, Canada has similar plans. As does the stock exchange in Stuttgart, Germany. In Canada, they are working on an app called Bison which allows investors to buy digital assets without paying a fee. A trading platform is also planned. However, the Germans want to take it yet a step further. They want to make ICOs possible on their platform, which would make trading new coins instantly possible. Currently, the market is dominated by Binance. The merely one-year-old exchange has now, after getting a foothold in China and Hong Kong, reached out and set up shop in Malta as well as in Liechtenstein. A cooperation between the crypto exchange LCX from Liechtenstein should open up a fiat gateway for investors to trade in euros and Swiss francs. Simultaneously, the government in Liechtenstein is in the processes of passing a law in order to attract crypto companies and ICOs. The goal is to create a valid alternative to the Crypto Valley in Switzerland. Blockchain companies are checking the legal situation in Malta, Gibraltar, Switzerland and Liechtenstein and in the end choosing to go to Vaduz, says Lawyer and Software Developer, Thomas Nägele. The so-called Blockchain Act, which is supposedly going to be enforced by mid-2019, is the brainchild of Prime Minister Adrian Hasler. Within this report, you will also find an extensive interview with the Prime Minister on the topic of Bitcoin, blockchain and cryptocurrencies. Which three letters are currently the most important within the Bitcoin sector? Surprisingly it is not FUD (Fear Uncertainty Doubt) but rather ETF (Exchange Traded Funds). Nothing seems to be influencing the price development quite like the question regarding if and when the American SEC will license a Bitcoin ETF. The numerous proposals, which have apparently been put before the commission, have so far only been declined. In late August, a total of nine ETF applications were all denied. According to the SEC, the decision itself is not an overall decision regarding Bitcoin; it is, however, an attempt to guard consumers from the unsafe and manipulated crypto market. In plain English: Bitcoin markets are simply not mature enough for the SEC at the moment. So why all the hype about a potential Bitcoin ETF? It would most likely create a simple, comfortable, and safe Bitcoin investment opportunity for investors because it would eliminate the storage problem. Trading with gold lends itself as a good comparison at this stage. Anybody wanting to buy precious metals needs a dealer, a safe place to store it and a way to insure it. Anybody wanting to resell his bullion, needs to physically take it out of the insured safe and find a buyer. This may seem like the most natural thing in the world for true believers who swear on physical investments and hold it long term as a hedge against monetary crisis. But in comparison to the handling of securities, physical storage is rather complicated. Stocks can after all be bought with a couple of clicks on your computer. An ETF takes out the complicated aspect of the process for the consumer (the physical buying and the storage), and in future an ETF could also provide this for Bitcoin. The ETF provider takes over the hard part and the consumer merely presses a button. According to some professionals, the bull market in gold and the resulting price bubble following the finical crisis was due to the inauguration of the gold ETF in the year 2004. Many Bitcoin investors hope for the same effect. The problem is that this ETF is taking its time to get underway and with every decline and postponement of the decision by the US commission board, the price fluctuates severely. To solely base your Bitcoin investment on this decision makes no sense at all in our view. 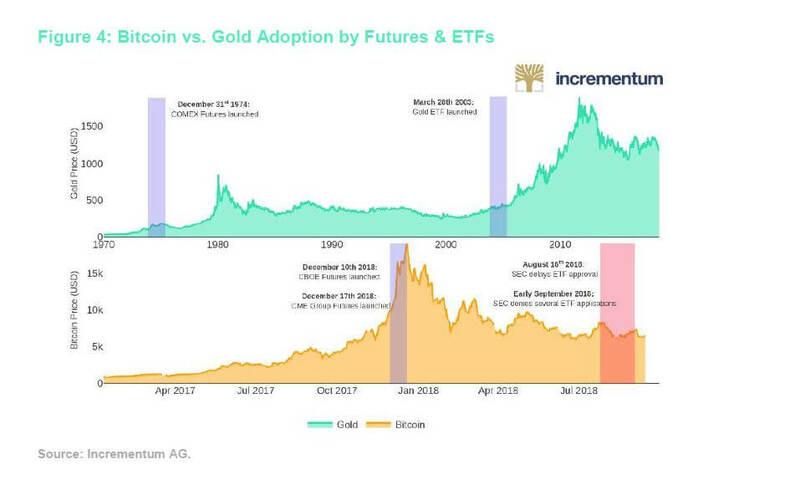 In the long run, there will be one or even an entire array of such investment solutions and the introduction a Bitcoin ETF could only have an ephemeral impact on price. At the end of 2017, Bitcoin futures were introduced to the market. This was an important step in the right direction. One of the futures providers, the CBOE, is also taking part in the race towards an ETF – and stands a good chance of being among the first to receive authorization. The SEC should treat Bitcoin much like gold or other raw materials, says the CBOE. When the first ETF will really be approved is yet to be seen and is not predictable at the time of writing. It could be weeks, months, or, worst case, even years. It all depends on how quickly the markets develop. As a reaction to the SEC, a couple of young American exchanges have pooled their resources together and created the “Virtual Commodity Association” to work on rules and standards for this young sector. The association is spear-headed by Gemini founders Cameron and Tyler Winklevoss. Some providers do not want to wait on an ETF decision by the SEC. The goal to attract more investors to the sector can also be accomplished via other routes. The most important game changer could possibly come directly from the Intercontinental Exchange (ICE) itself, owner of the New York Stock Exchange. By November, ICE is planning to set up a futures contract with physical delivery. This means, “real” Bitcoins will be going over the counter. The infrastructure of the ICE will be the base of this operation and later a company called Bakkt will take over the crypto plans of the exchange. The Microsoft cloud will be the corner stone for a new crypto trading platform. But the plans do not stop there. “In bringing regulated, connected infrastructure together with institutional and consumer applications for digital assets, we aim to build confidence in the asset class on a global scale,” ICE Chief Executive Jeffrey Sprecher said. He goes on to elaborate on the future: “Bitcoin could greatly simplify the movement of global money. It has the potential to become the first worldwide currency.” At this point we are drawn to point out that gold already has this role as a global currency for a couple of centuries, but we greatly appreciate Sprecher’s enthusiasm towards the innovation of Bitcoin. Sprecher points out that Bitcoin and other cryptocurrencies desperately need a clear set of rules and a reliable infrastructure. We are clearly only at the beginning of this phase. One of the first partners of Bakkt is supposedly going to be Starbucks. This in short means that customers will in the near future be able to pay for their double shot iced caramel soy-milk Frappucino with digital money. “As the flagship retailer, Starbucks will play a pivotal role in developing practical, trusted and regulated applications for consumers to convert their digital assets into U.S. dollars for use at Starbucks,” Maria Smith, vice president, partnerships and payments for Starbucks, said in a statement. As mentioned before, times of falling prices can be beneficial because they are an impetus for research and innovation to improve the technology. However, positive developments and news do not immediately translate into rising prices. FUD and ETF are not the only acronyms influencing the crypto market. Many paths lead to a wider acceptance of Bitcoin, and the Chartered Financial Analyst (CFA) Institute and International Monetary Fund (IMF) joining the crypto team are likely to help score some points. As mentioned in the previous report with the “Goldman Effect”, we can once again observe the establishment of Bitcoin in “the real world”, or at least on Wall Street. Thousands of people head to the CFA Institute to undergo excruciating tests in different financial topics in order to call themselves “certified experts”. They now have included questions on crypto markets and Bitcoin into their curriculum. “We saw the field advancing more quickly than other fields and we also saw it as more durable,” said Stephen Horan, managing director for general education and curriculum at CFA Institute in Charlottesville, Virginia. “This is not a passing fad.” The CFA seems to be reacting to the rising demand from Asia, where most of crypto trading takes place. In need of more acronyms? How about IMF? The International Monetary Fund is the capital of the international mainstream monetary system. It goes without saying that the IMF originally regarded Bitcoin with a good portion of skepticism, to say the least. However, there has been a slight transition to this first wave of disapproval. Christine Lagarde, the Managing Director of the IMF, has even gone as far as to say that cryptocurrencies have the potential to make the financial system safer. However, she had to balance out her enthusiasm because after all, she is the boss of one of the institutions that Bitcoin is disrupting. As expected of her as a good IMF boss, she did go on to warn against the potentials of a “new vehicle for money laundering and terror financing”. Overall though, IMF is sending a positive signal for cryptocurrency investors. Recently, IMF experts went as far as describing a world in which traditional banks, private money and cryptocurrencies all peacefully co-exist. Central banks per se have not yet found a consensus on their stance towards Bitcoin. The Bank of International Settlements (BIS), the central bank of all central banks, has declared itself in opposition to the crypto world. In June, the economists of the BIS published a 26-page report against Bitcoin. Starting with the fact that it is already an environmental disaster and continuing on to state that the promise of the founders will never be met by the current system. The decentralized structure of cryptocurrencies should be seen as a weakness, not as a strength and it is at the end of the day just “too risky” to run a global economy without a center, says the BIS. “Trust can evaporate at any time because of the fragility of the decentralized consensus through which transactions are recorded,” the report concluded. “Not only does this call into question the finality of individual payments, it also means that a cryptocurrency can simply stop functioning, resulting in a complete loss of value.” On top of all this, the BIS claims that Bitcoin could bring the whole Internet to a standstill. Jay Powell, the head of the US central bank, sees the matter slightly more relaxed. In mid-July he stated in a hearing that the crypto sector is not big enough yet to actually pose a serious threat to the financial system. At that time, the market capitalization was at roughly $300 billion. By mid-August, it fell by another $100 billion. The FED has no regulatory power over cryptocurrencies and is also not interested in such an extension of supervision, Powell said. The price of Bitcoin and all other altcoins are on a downwards trend since the beginning of the year. As we can observe, many of the serious contenders are using this time to expand and solidify a new infrastructure. Countries, such as Liechtenstein, are preparing for the next stage of the blockchain revolution. Traditional players such as the IMF, the FED, and the BIS have an eye on Bitcoin and the cryptocurrency market as a whole. Wu believes that in the future, traditional assets in the shape of tokens will be traded freely but not in the form of crowdfunded ICOs. Naturally, he wants to start an IPO on an exchange with his company Bitmain, so he does have his own agenda in mind. In our opinion, he does however have a point. ICOs were the hype of 2017 and especially pushed the price of Ethereum. How far the prices could plummet when the bubble does decide to burst once and for all is too scary to imagine at this point in time. Wu deserves to be heard as he does sometimes know what he is taking about – not something you can say about everyone who is inclined to voice their opinions publicly about Bitcoin and the crypto market these days. We can of course not contradict this statement as (sadly) nobody can look into the future. The specificity of the number does, however, strike us as odd. 10 years ago, there was no such thing as Bitcoin, some investors can even remember a time in which $100 seemed like an extremely high prognosis. Giving Stiglitz’s statement a positive spin, we would say that considering Bitcoin to still exist in 10 years and still have a monetary value is good enough for us at the moment. From an investors point of view, such forecasts, be it bullish or bearish, are always to be treated with caution. And he is right. At the all-time high, when Bitcoin was worth $20,000 apiece, the whole market was not even worth a trillion. However, many analysts expect to see Bitcoin to land somewhere in the region of $5,000, $4,000, or maybe even $3,000 before we can say the bear market is over. In the long run, it will be interesting to see if Stiglitz or Draper turn out to be right. Bitcoin and cryptocurrencies in general have the potential to let Draper’s fantastical dreams come true. On that path, however, many, very powerful, traditional financial institutions must still adapt or even fall. We can therefore understand why Stiglitz anticipates strong resistance. To stop Bitcoin as a whole, it would however take a level of international cooperation on a never before seen scale. Satoshi Nakamoto’s vision is intact. Bitcoin has stepped into the ring with fiat. New against old. Online against offline. De-centralized against centralized. And no matter the outcome, it is going to be one hell of a ride. See “U.S. investor sues AT&T for $224 million over loss of cryptocurrency,” Gertrude Chavez-Dreifuβ, Reuters, August 15, 2018. See “The SIM Hijackers,” Lorenzo Franceschi-Bicchierai, Motherboard, July 17, 2018. See “Bitcoin Trading in Venezuela is skyrocketing amid 14,000% inflation,” John Detrixhe, Quartz, June 8, 2018. See “Regulated Crypto Custody Is (Almost) Here. It’s a Game Changer,” Olga Kharif and Sonali Basak, Bloomberg, June 18, 2018. See “Fidelity, a household name in American investing, is plotting a big move into cryptocurrency trading,“ Frank Chaparro, Business Insider, June 6, 2018. See “A Traditional Stock Exchange Is Also Going to Trade Cryptocurrencies Like Bitcoin,“ David Meyer, Fortune, July 6, 2018. See “Boerse Stuttgart to develop ICO platform and MTF for cryptocurrency trading,” Finextra, August 2, 2018. See “Binance LCX Launches Fiat-toCrypto Exchange in Liechtenstein,” Ana Alexandre, Cointelegraph, August 16, 2018. See “Krypto-Start-ups entscheiden sich selten gegen Liechtenstein,” Pascal Züger, Cash, August 13, 2018. See “PwC’s Pierre-Edouard Wahl: Blockchain Can Bring Positive Competition to Swiss Banking Space,“ Molly Jane Zuckerman, Cointelegraph, August 8, 2018. See “Bitcoin ETFs Aren’t Coming Any Time Soon Thanks to the SEC,” Rachel Evans and Lily Katz, Bloomberg, August 23, 2018. See “Are Bitcoin ETFs Back on the Table Again?,” Crystal Kim, Barron’s, March 27, 2018. See “The Biggest Digital Exchanges Are Teaming Up To Police the Crypto Space,” Matthew Leising, Bloomberg, August 20, 2018. See “NYSE-owner ICE to form new company for digital assets,” John McCrank and Anna Irrera, Reuters, August 3, 2018. See “Breaking: World’s Biggest Stock Exchange Operator is Launching a Bitcoin Market,” CNN, August 3, 2018. See “New Starbucks partnership with Microsoft allows customers to pay for Frappuccinos with bitcoin,” Sarah Whitten and Kate Rooney, CNBC, August 3, 2018. See “’This Is Not a Passing Fad’: CFA Exam Adds Crypto, Blockchain Topics,” Michael Patterson and Andrea Tan, Bloomberg, July 16, 2018. See “Bitcoin tools could make finance system safer, says IMF boss,” Richard Partington, The Guardian, April 16, 2018. See “Bitcoin Could Break the Internet, Central Bank Overseer Says,” Edward Robinson, Bloomberg, June 18, 2018. See “Powell Says Cryptocurrencies Aren’t Big Enough to Pose a Threat,” Olga Kharif, Bloomberg, July 18, 2018. See “ICOs an ‚Unsustainable Financial Bubble’: Jihan Wu,” CCN, August 22, 2018. See “Bitcoin price warning: BTC will drop to ‘$100’ after being ‘regulated into oblivion’,” David Dawkins, Express, July 9, 2018. See “Billionaire Investor Bill Draper Explains Why Bitcoin Will Hit $250,000 in 2022,” Jordan French, The Street, July 25, 2018. See “Another Crypto Fail: Hackers Steal $23.5 Million from Token Service Bancor,” Jeff John Roberts, Fortune, July 9, 2018. Nikolaus is a journalist with the daily paper „Die Presse“ in Austria. Among other things, he covers monetary policy, precious metals, and general macro topics. 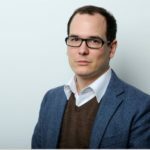 He is also the author of a weekly finance column called „Wertsachen“. Nikolaus has been writing about Bitcoin and the blockchain since 2012.